How long have you been running? Since I was 11. How long have you been running barefoot? Since spring of 2008. What led you to running barefoot? I got injuries in college from over training, ITBand and Patella Injury called Runner's knee. I found it harder and harder to run...I have always loved to run. It got to a point where I couldn't even run 1 mile without pain. My current running shoes needed to be replaced but I just didn't want to buy another pair of running shoes. That did not seem to be the answer. I did a lot of research on the internet about barefoot running (a big thank you to Barefoot Ted and Barefoot Ken Bob for their websites). One day, I said to my husband, “ What would you think if I ran barefoot?” He said, “Go for it! Give it a try.” I did. It worked. I started a little at a time every other day. Slowly built up my mileage. That was 3 years ago. What was your longest barefoot training run for Boston? My longest barefoot training run for Boston was 10 miles. I ran a 20 mile training run in my VFFs because it was about 28 degrees with a wind chill that made it feel like 10 degrees. And I did the Hyannis Marathon on February 27, 2011, as a training run, in VFFs, because again, the weather was cold, wet, snowing, and sleeting for most of the race, and I got a 3:50:49. I placed fifth in my age group with that time at Hyannis. What were the biggest challenges you faced while training for your first marathon? Training in the winter and trying to run barefoot in weather below 32 degrees. I had to wear my VFFs. And when I wasn't in the mood to wear those, I wore a pair of toe socks with duct tape on the bottom. Those worked well in dry weather. What was your qualifying time for Boston and where? My qualifying time was 3:49:28 at the Sugarloaf Marathon in Maine in May 2010. I ran 10 miles of that marathon barefoot and the rest in my VFFs. I ran and raised money for the American Cancer Society. What did training for the Boston Marathon involve? Running every other day. One speed workout a week (800's) and one long run a week. As much as I could completely barefoot. I also worked out with weights in the gym two times a week. 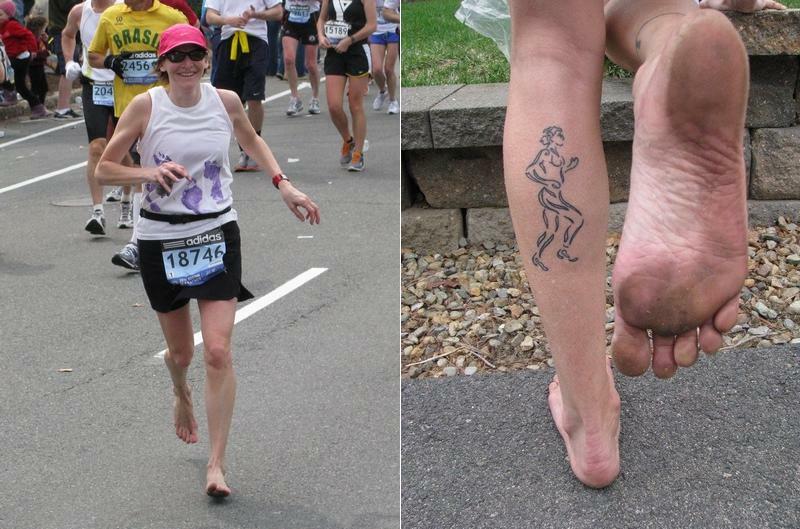 If the Boston Marathon had a Barefoot Runner Division, would you have entered it? Definitely! How would you rate the Boston Marathon's barefoot-friendliness? It was ok. The first half was on old tar roads, which I call “ pokey tar,” and some places had a lot of dirt still on the road from the winter, but otherwise, it was barefoot-friendly. Were the crowds receptive to you? Yes. They cheered for me like any other runner. If they saw the back of my shirt which said “ Barefoot Mama,” they would yell, “ Go Barefoot Mama!” or just “ Way to go barefoot runner!” It was really fun. What was your completion time for Boston? I believe it was 4:01:16. Do you have any advice for those who would like to qualify for Boston or at least complete their first barefoot marathon? Take it slow. Allow yourself time to let your feet rest, just like the rest of your body, between your training runs. And condition your feet and legs by walking in your bare feet as much as possible. Cross train. Bike or swim on the days you can't run. Believe in yourself! Have fun...barefoot running is really fun and freeing! Enjoy it! If your training becomes too hard or not fun anymore, just take a few days off. When training, try to train in measurements of time and not so much mileage, i.e., running for 15 minutes instead of 2 miles. Always be willing to learn more. Go online for research or go to a barefoot running workshop. It's great to get encouragement from others who share your passion for running. I'm still learning more about my barefoot running form and technique every time I run. I learned something funny running this marathon barefoot that I didn't “ train” for or really think about. Nobody ever tells you how to avoid the sticky Gatorade at the water stops! I would run through the Gatorade section of the water stop where my feet would get all sticky, then grab a water, take a few sips, keep running, then after I passed the whole water stop, I would dump the rest of the water in a puddle and then stamp my feet in the puddle to rinse off my feet. I started to hate seeing a water stop. I wanted a drink, but I didn't want to stop to keep rinsing my feet. I just thought it was a funny tip. I have wanted to run the Boston Marathon since I was about 17. That was in the mid 1980s. Women had not been running in the Boston marathon for that long at that point. Running in the Boston Marathon was special in more ways than one. I finally was able to qualify and run in the Boston Marathon! A HUGE dream of mine. I believe I would never have made it if I hadn't found a way to run again. Because I took a chance and decided to give barefoot running a try, I was able to live my dream. I had tears in my eyes when I crossed the finish line. Do marathons, 10Ks, etc. actually have a "barefoot division?" Barefoot division? They don't. Unfortunately :( Some local events do put up a barefoot category but is not the norm.